New Cascadia flags are in! Order online for $23.50 — CascadiaNow! 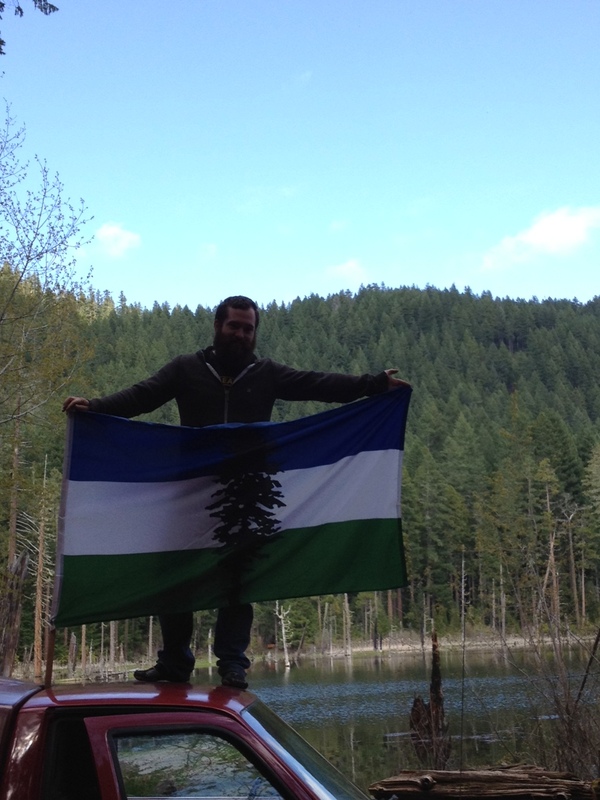 The Doug flag is the symbol of Cascadia and a new batch of Cascadia Flags have arrived. Those interested should send $23.50 to cascadianmycelium@gmail.com using either Paypal or Wepay. The flags are 5'x3' nylon and will be shipped out as soon as possible, except for between the dates of June 19th to 25th. A portion goes to supporting Cascadia Chapters. Designed in 1994 by Portland native and professor Alexander Baretich, it can increasingly be found in cities throughout the Pacific Northwest and is becoming a common sight at soccer games, occupy protests and of course, on locally made microbrews (among our favorite, the Secession IPA or Cascadian Dark Ale). The blue of the flag represents the moisture rich sky above and Pacific ocean along with the Salish Sea, lakes and other inland waters. Our home is of continuous cascading waters flowing from our sky and mountains back to the Pacific. For Cascadia is a land of falling water from the Pacific to the western slopes of the Rockies and Cascades where water cycles as vapor and then rain and snow to run through creek and river back to the Pacific. The white represents snow and clouds and the green to represent the evergreen forests and fields of the Pacific Northwest. The lone standing Douglas Fir symbolizes endurance, defiance and resilience, named for explorer David Douglas, the first written account of the bioregion as a land of cascading waters and from where our primary mountain range takes its name. All these symbols of color and icon come together to symbolize what being Cascadian is all about. Newer PostPortland and Seattle potlucks confirmed for this weekend! A Cascadia Party and Caravan to the Peace Arch!